Case 1. 20 yo female who appears intoxicated. Patient was brought in by her roommate who was concerned about her. Patient was at dorm party the night before. On exam patient is disoriented. She is tachycardic and her mucosa is dry. ABG shows metabolic acidosis. Patient also has an osmolal gap. Patient was treated with IV fomepizole. Toxic alcohol screening was positive for ethylene glycol. 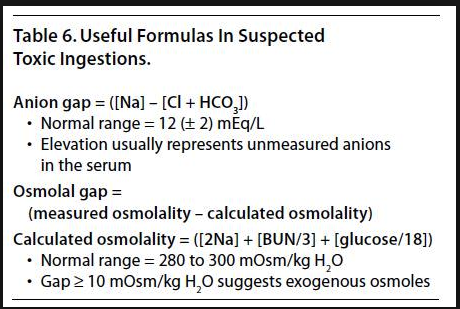 Anion and Osmolar Gap Calculations. For the calculated osmolality, you can also factor in ETOH by adding ETOH/4.6. The way to remember 4.6 is that there are 4 six packs in a case of beer. For easy calculations on boards round 4.6 to 5. Case 2. 19yo female presents with "flu symptoms" with fever and muscle aches. Patient had some nausea and vomiting. She also had a bloody nose. She is tachycardic and hypotensive. 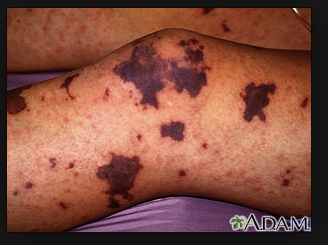 On exam patient has a petechial rash. Labs show thrombocytopenia and AKI. Lactate is also elevated. Diagnosis is disseminated meningococcemia with DIC. 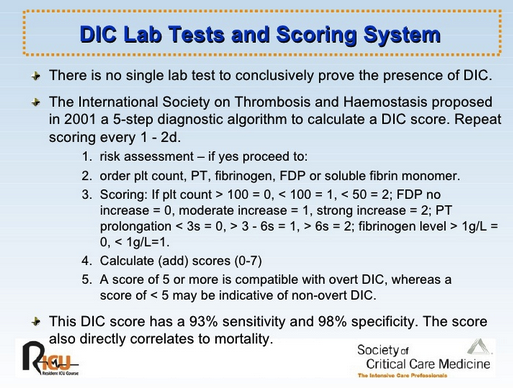 It can be tough to differentiate these diagnoses but DIC has coagulopathy with prolonged PT/INR whereas the others do not. Case 3. 19 yo female with blunt trauma to right eye. Patient has worsening visual acuity of injured eye with associated afferent pupillary defect. CT shows retrobulbar hematoma. Treatment is lateral canthotomy. Retained placental tissue can result in persistent vaginal bleeding days after delivery. If a patient has a seizure in the second half of pregnancy or in the post-partum period, treat with magnesium for ecclampsia. Mag dosing is 6g IV followed by a 2g/hr drip. Management approach to gestation trophoblastic disease. It is a bit beyond what is needed to be known for EM but it may be helpful to know that OB will follow up with serial HCG's and a CXR and base further management on those screening tests. If you have some clinical suspicion for cervicitis or PID, just treat them in the ED. Don't wait for the results of testing. Many patients cannot be contacted after they leave the ED. In a child, foul smelling vaginal discharge is highly suggestive of vaginal foreign body. The most common vaginal foreign body in a child is retained toilet tissue. You can most easily remove the foreign body with saline irrigation. Most common organism causing mastitis is staph aureus. Consider HELLP syndrome in every patient >20 weeks pregnant with RUQ pain. 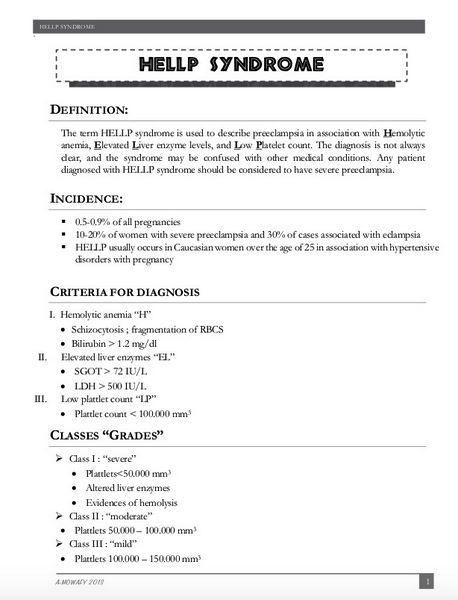 LDH will be elevated in HELLP syndrome. Tubo Ovarian Abscess is usually initiated by GC or Chlamydia and as the infection progresses it becomes polymicrobial. Treat with broad spectrum antibiotics. Side effects of post-exposure prophylactic medication for HIV include fatigue, nausea, and abdominal pain. When is radiation exposure the greatest risk to the fetus? 2-8 weeks during organogenesis. At 8-15 weeks the fetus is prone to neurodevelopmental issues. After 15 weeks there may be growth retardation. However, all the ED imaging studies we do, including CT's, are under the 10rad threshold for causing teratogenic effects. Cut down to the bone in the mid-line dorsal position of the digit. Alternate therapy is NAIR but Nair is not fool -proof. Cutting down to bone is more reliable to remove the hair tourniquet. Other causes of fussiness to consider in an infant are #1 sepsis, non-accidental trauma, and uti. Colic is another common diagnosis for fussiness in an infant less than 3 months of age. Paradoxial irritability, where the child does not want to be held, points to meningitis. Purrulent eye drainage 3d-3weeks. Get culture of eye drainage and treat with ceftriaxone and erythromycin to cover GC and chlamydia. Uric acid crystals in the diaper can look like blood in the diaper. It will be heme neg. It has a salmon color. No need to get a UA, it is benign. Encouraging parents to increase child's fluid intake may lessen this finding. Uric acid crystals in diaper. Take the time to see your doctor and to see your dentist! We as docs don't take the time to do this. It is important. Sleep deprivation has major physical and cognitive impacts. It will negatively affect your interpersonal relationships. So prioritize your sleep! Sleep is the #1 factor to a person's wellness. Eat food, mostly plants, not too much. That is eat real food, not food-like substances. Don't drink your calories. Plant-based foods should predominate in your daily food intake. Watch your portion size. Leave the table a tad bit hungry. It takes your body 20-30 minutes to feel full and if you eat real fast you may overeat before you feel full. Don't eat anything with more than 5 ingredients or with any ingredient you don't recognize. You don't need tons of exercise to be healthy. 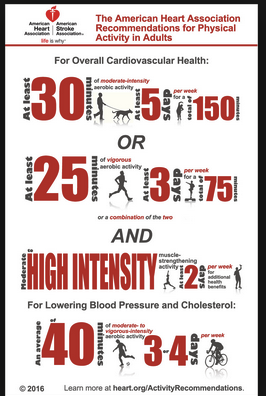 150 minutes a week of moderate exercise or 75 minutes of vigorous exercise a week is recommended. Exercise is the #2 most important factor to a person's wellness.